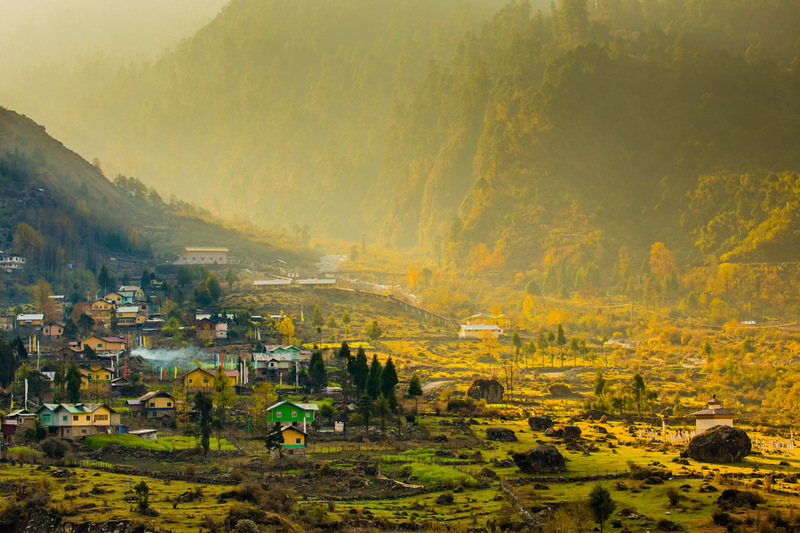 Small but beautiful, Sikkim is situated in the Eastern Himalayas. Spread below the Mount Khanchendzonga, (8603 mts. ), the third highest Mountain in the world and revered by the Sikkimese as their protective Deity, Sikkim shares her borders with Tibet in the North, Bhutan in the East, Nepal in the West and State of West Bengal in the South. With an area of 7,300 sq. kms. and measuring approximately 100 kms. from North to South and 60 kms. from East to West, the elevation ranges from 244 mts. to over 8540 mts. above sea-level. The land that unfolds your imagination. Traversing through excitement, thrill, adventure and myriad of ecstasy and joy in flora, fauna, landscape, white topped mountains and friendly people. It is our unique privilege to offer you the most exciting package Tours and Treks, River-Rafting, Yak-Safari, and other adventure activities to places far from the maddening crowd and to the yet unknown interiors of the Himalayan regions of Sikkim. We offer the most cost-effective packages ideally planned, suited and tailor-made for exclusive and moderate categories of adventure lovers. Nature has been generous. Sikkim is noted for her floral wealth and an estimated 4000 varieties of flowering plants and shrubs are found. There are over 600 varieties of orchids. From an altitude of 2400 mts. Rhododendrons can be found. The gentle slopes of the high altitudes are covered by a variety of beautiful flowers like the primula, meconopsis, gentians etc. The rivers have trout salmon and carp. Naturalists have cataloged over 550 species and sub-species of birds, among them many flamboyant pheasants and over 600 species of butterflies. Animals abound in the dense forest of Sikkim : The dreaded Himalayan bear, musk and barking deer, marbled cats, red panda, the blue sheep etc. Three main groups of people make up the population of Sikkim. The Lepchas, Bhutias and the Nepalese. Sikkimese by nature are simple, polite and non aggressive-a people with a natural gaiety.